Calling all international students!! Have you just moved to Finland for an exchange or have you perhaps lived in this country for years and always wondered what proper Finnish beer is like? Or maybe you’ve only tasted the cheap supermarket dishwater and realised that’s no good? 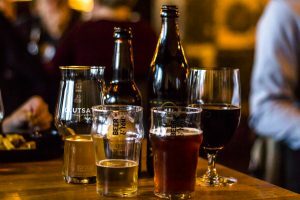 Now’s your chance to come and change your impressions about Finnish beer as the Jyväskylä students’ beer society DOS is organising a proper introduction to Finnish craft beer, curated by our partners at Teerenpeli. This event will be hosted in English so gather round your international student friends and drink yourselves merry with DOS. Signing up ends on Friday 15.2. at 16.00 or when we have reached the maximum capacity. After Friday 15.2. at 16.00 you can’t cancel your participation and you have to pay the entrance fee. You will receive the instructions for payment via email after the sign-up has been closed. We will also inform the ones that didn’t fit in. Beer evenings are usually only open for registered members of the beer society DOS but this time we are making an exception as the night is intended for international students. You can however join us via the signing up form and by paying the 5€ entrance fee if you so wish. The membership includes a membership card and an overall patch and the card will give you discounts in selected partner restaurants.